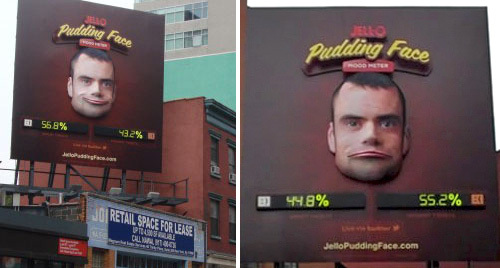 Jell-O's Creepy 'Pudding Face' Billboard Reflects The Mood On Twitter | OhGizmo! Well, I’ve found the source of my nightmares for the next 3 weeks, and it comes in the form of Jell-O’s latest advertising campaign. It started out with a website featuring a giant face that frowns or smiles based on the general mood on Twitter; a larger percentage of smiley faces being tweeted results in a smile, while a larger percentage of frowns results in – you guessed it – a frown! But the campaign is being taken to a whole new level with the recent installation of a billboard in Manhattan that features an even larger, mechanical 3D version of the face that physically smiles or frowns based on Twitter’s mood. I’m happy I don’t work in an office overlooking the ad, because even when smiling it sends shivers down my spine. So thank you Crispin Porter + Bogusky, I’ll never eat pudding the same way again! The biggest problem isn’t the disturbing mouth, but the fact that the rest of his face – his eyes, cheeks, forehead – don’t smile with him. How can there be a “general mood on Twitter”? Mood about what?